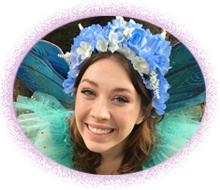 Fairy parties are a great way to surprise and celebrate a special occasion. A fairy birthday party is a favourite for many, but we also have over 200 popular characters to choose from. Fairy parties are a favourite way to celebrate any special occasion. Meet out beautiful fairies below or browse through our extensive selection of popular storybook and TV characters on our choose a character page. Listen quietly next time you are near a fairy garden, can you hear the tinkling of little bells? If you can then stay very still and you may catch a glimpse of me teaching the baby fairies how to fly. They are too small to fly far but soon they may be able to fly with me to your party for some fairy fun. My name is Fairy Flower. I’m the fairy who cares for the flowers in the garden sprinkling them with water whenever they need.I love making fairy rings with the flowers that have fallen to the ground and my favorite thing is dancing and telling stories. I hope we can dance together at your party. Hello fairy friends my name is Fairy Dream. I am the fairy who makes sure you are having only the sweetest of dreams when you lay your head on your pillow at night time. My favourite thing to do in fairyland is dance and i can’t wait to dance with you at your party. Wishing you all sweet dreams. Fairy greetings! My name is Fairy Butterfly and I live far away in fairyland. I spend most of my days flying with my butterfly friends while they search for their favourite flowers to feed from. Some of their favourite are the sweet nectars from sunflowers, tulips and poppies. My friends call me Butterfly because I fly just like one, way up high in the clouds or down low near the garden. My favourite food is fairy floss and I would love to visit you at your next party so I can plays lots of fun fairy games. My name is Fairy Star and I’ve come a long long way, from Fairyland I fly to you on your very special day. I use my sparkling star wand to make the stars shine bright,with glistening wings and fairy dust I am a shining sight! I invite you all to come and play and have some fairy fun, from the magic moment I knock on your door the fun has just begun! Hello friends. My name is Fairy Blossom because I was lucky enough to be born in a rose blossom many moons ago.Ever since then my friends have called me fairy Blossom.I also love to wear pretty flowers in my hair.I hope to meet you and your friends one day soon so we can play games together and share in the fairy magic of your special day. Hello fairy friends. My name is Fairy Sparkle and I am the fairy who loves bringing glitter and sparkle to every party I visit. I love telling fairy stories and eating fairy bread at the bottom of the garden with all my fairyland friends. I hope to meet you one day and share my fairy stories with you.